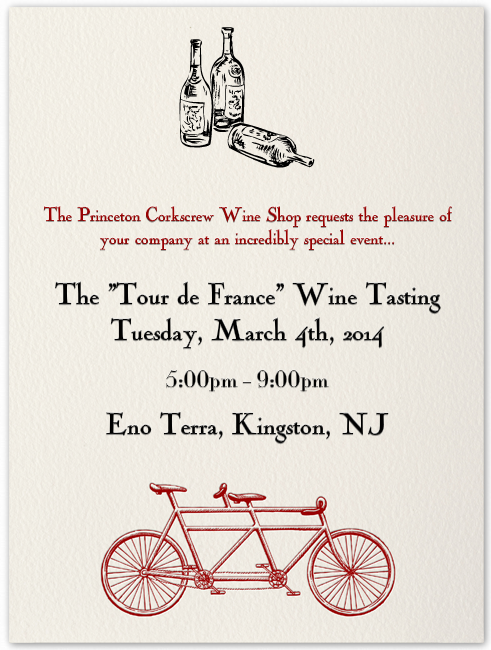 Come join us at Eno Terra restaurant on Tuesday, March 4th, 2014, Mardi Gras, for one of the greatest wine-tasting events Princeton has ever seen! There will be twenty producers from every single major wine-producing area in France, featuring over 30 different wines. The open house tasting will run from 5:00pm to 9:00pm-- you can stop by at any time. These twenty winemakers make an annual trip to showcase their wines in Washington, D.C. and New York. This year, for the first time ever, they have been convinced to make Princeton, NJ, their one extra stop. Eno Terra has organized a grandiose tasting, with my help, to give our customers the rare opportunity to taste some of the most delicious, terroir-driven wines coming out of France. We feel very lucky to invite our customers to this incredible event, to get the chance to meet and talk to all of these producers, to understand their passion, and to taste some great wine! The event will cost $30 per person, payable directly to Eno Terra.Click on the Eno Terra logo link below to make your reservation. (Click on March 4th on the calendar, then click on the event name that pops up on the right in order to pay via PayPal.) Space is limited, so we recommend you reserve your spot early. If there are an y tickets remaining, they will be available for purchase at the door on the night of the event for $40 per person. We will offer a free continuous shuttle service going back and forth between the Corkscrew and Eno Terra that night, throughout the entire event, for those who would prefer not to drive. There will be free valet parking at the restaurant, but we expect it to be a very busy night and parking is extremely limited-- please consider car-pooling or using the shuttle! Eno Terra will be serving light hors d'oeuvres, breads, and cheeses prepared by chef Chris Albrecht for guests to enjoy during the event. If you would like to have dinner at Eno Terra, either before or after you attend the tasting, they have requested that you make a reservation ahead of time. The tasting will be held upstairs on the second floor of the restaurant. Click the link below to preview the producers who will be coming and the wines that we'll be tasting. Meet the producers pouring at the "Tour de France"
So many of these producers are personal friends of mine, and it is a great pleasure to have them all gathered together in Princeton for suchan incredible, truly once-in-a-lifetime wine tasting event. Be sure not to miss it! We very much hope to see all of our customers there.